Restaurants for foodies. Restaurants for Restaurants. South Africa. At the moment 4th Avenue, Parkhurst, is booming with life. Rocket touched-down a few weeks ago, in that prime spot which played host to “The Attic” for several years. We decided to try it out for Sunday lunch, hoping for more of a starburst than a damp squib. Rocket is the second in a restaurant chain, the first being in Rivonia. It is sharply decorated, simple and light inside, with a large outside terrace. The pleather chairs and plastic tablecloths are not all that chic, but I suppose they lend themselves to frequent use. And frequently used they certainly will be, Rocket was nearly full when we arrived, really buzzing with life and happiness on a hot Sunday afternoon. We ordered some drinks off the short, but interesting, wine list. Some wine options include Cederberg Bukettraube and Thelema Sutherland Pinot Noir. There is also a nice selection of champagne and MCC, and an interesting cocktail list. The selection of Craft Beers is particularly appealing, with the likes of Jack Black Premium Lager, Darling Slow Lager and Mitchells Milk and Honey all served on tap. It was a sweltering afternoon, so we decided to stick to cool, refreshing beverages. I had a glass of Villiera Tradition MCC Brut Rosé and we also really enjoyed an icy-cold bottle of Delaire Cabernet Franc Rosé, a popular favorite and with good reason. The menu is diverse, and rather like an upmarket take on Espressos – which is directly across the road – with a range of café food and a pop of Asian for good measure. There are some tempting starters like oysters as well as some interesting main dishes. Expect to come across red and green curries, yummy-sounding burgers, salads, fillets and pastas. 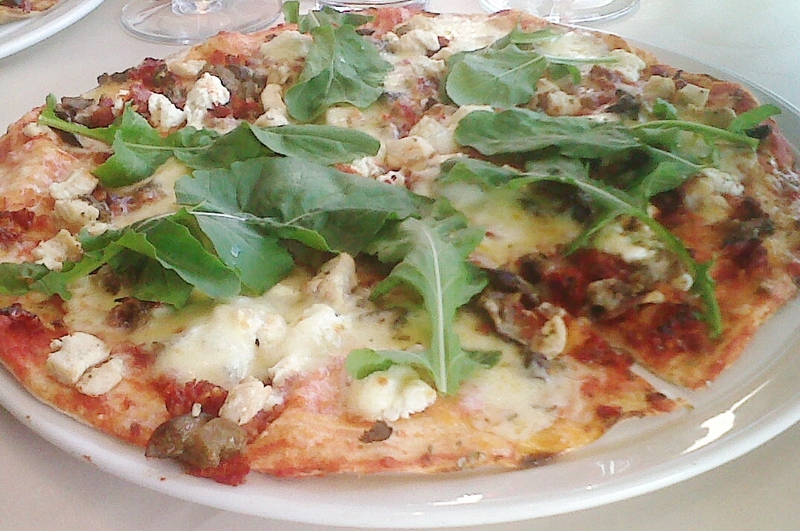 The food focal point is definitely the gourmet pizzas – which sounded too good to pass up. I thoroughly enjoyed the Hungry Goat pizza. A thin and really flavorsome crust, topped with a delicious tomato base, smothered in mozzarella and topped off with goats milk cheese, chicken, grilled aubergines, sundried tomatoes, rocket (surely a requisite) and rosemary. I think this combination really is a winner. The saltiness of the cheese and sweet sundried tomato are a perfect match, and the addition of rosemary added depth and a meatiness to the flavor. It was absolutely scrumptious. 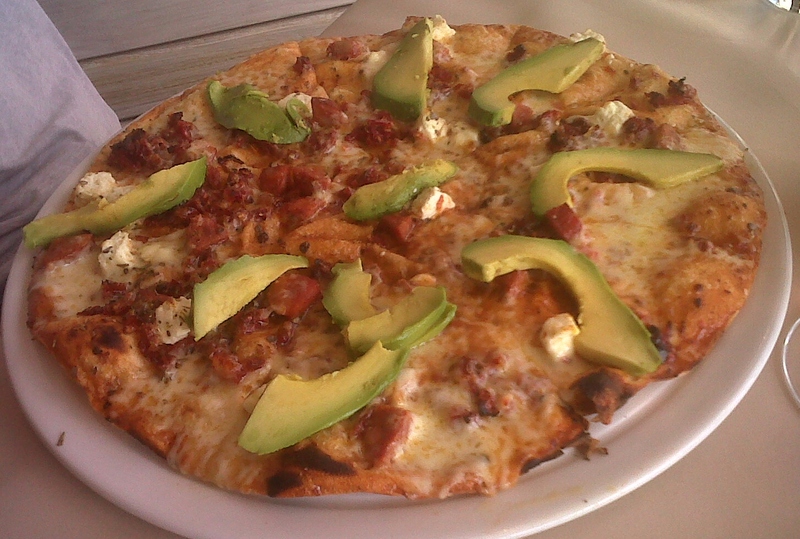 My fellow diner had the Benefica Pizza, topped with goats milk cheese, fresh, bright-green avo, sundried tomato and chorizo. I was assured that it was as delicious as mine. We were both full after the pizzas, so didn’t order desert. The desert menu features only 5 options, but I’d think that all sweet tooths will find something that they fancy. Unfortunately, the food rather eclipsed the service. It all started off well. We were warmly welcomed by the manager, and luckily snagged a prime table on the terrace. Our waiter came over with the menus in a timely fashion, but he was rather curt and not very affable in his address and we found this a bit disconcerting. Our food and drinks arrived in good time, but again there were some rookie errors which threatened the outcome of our mission. Knives, forks and napkins were only brought to our table after we got our pizzas, the stem of my wine glass was rather sticky and a puddle of MCC – which had been spilt on our table while it was served – was not cleaned up. Odder still, was the way our waiter seemed to turn into an attentive little comet whilst we were eating. Naturally, when one is engaged in conversation, eating takes longer. Occasionally, I would feel a little “tap, tap, tap” on my arm. Surprised, and interrupted mid-sentence, I would whip around to find “mission control” had come to check whether I had finished my food yet. This happened 3, maybe 4, times during the meal and it was rather frustrating. The tapping was a bit unprofessional, and I felt hassled when it came to finishing my food. My dining companion finished his pizza before me, and his plate was whipped off the table at break-neck speed – he barely had time to put his knife and fork down. Following this, the service took a nose-dive, to such an extent that we had to ‘self-abort’ the mission – I went inside to seek out our waiter, ask for the bill, and then again to ask him for the card machine. Of course, Rocket is a new restaurant, and the lacklustre waitering may be due to inexperience and those teething problems which invariably crop up during the first few months – let’s hope management can bring things back into orbit. Rocket, like most of the other restaurants in Parkhurst, seems popular and is gaining a following. It is as though the area can sustain ever more eateries – all so ‘in demand’ that they are seldom empty. Some are worried that the appearance of several chain restaurants will blight the area, moving away from the ideal of small, local businesses. It is possible that the Parkhurst restaurant bubble may burst, but for the moment it has a lot to offer, with Rocket being a definite must try. It provides another option for meeting up with friends in a jovial and relaxed atmosphere, to people-watch and enjoy a long afternoon meal or a tasty dinner before you hit the local bars. 1 glass MCC, 1 beer, 1 bottle wine and two pizzas cost R 375.00 including tip. You can contact Rocket on +27 (0) 11 880 6102 (Rocket Parkhurst telephone number). Firstly, thank-you for allowing a restaurant to respond to a review. It is fantastic that you have created a platform where the review can be interactive. I appreciate all the comments you have made, both positive and negative. With regards to the food, we take the utmost pride in every meal that we send out. Everything is made fresh every day, with no corner cut on any ingredients, ensuring that our quality is of the highest standard. I am very happy that this was something that you experienced. I must however say, that good food is nothing without good service. A waiter must have just the right amount of attentiveness. Too much or too little are equally aggravating. I don’t want to use the excuse that the poor standard you experienced can be attributed to teething problems as I feel that if a shop is not ready to open then it should not open. Our waiters are trained for months before they are put on the floor, and their training is continual. The fact that you had a waiter tapping your arm during your meal is mortifying, as is the fact that after your meal his attention went to other tables. I can assure you these issues will be addressed. Thanks again for the feedback, and I hope to see you at Rocket Parkhurst, Rocket Rivonia, or Rocket Express in Sandton sometime soon!